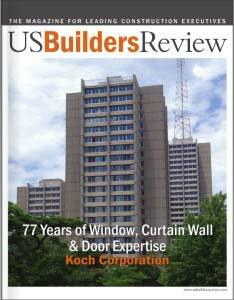 Koch Corporation was recently written up in the US Builder’s Review, Fall 2013 Edition III. Sean O’Reilly & Molly Shaw correctly describe Koch as having increased their national footprint across the continental U.S. In 2013 alone, Koch had employees in Anchorage, Alaska, Buffalo, NY, Louisiana and Tampa, Florida, just to name a few of the states where Koch was putting their 77 years of expertise to work. O’Reilly & Shaw go on to point out that Koch offers in-house product application design services, shop drawing and drafting and that they have an on-site fabrication facility. They quote Koch’s CEO, Benjamin Feinn as saying, “If we’re acting as the prime glazing contractor, about the only service we won’t perform is roofing. Because we’ve been around for 77 years and we’ve never left anyone high and wet, we get a lot of calls from general contractors who want us to work with them. Some people shop around based on price, but we stand for quality.” To read more about Koch in the US Builder’s Review, click here for the full article. To read the article in the copy edition, go to page 81-84.